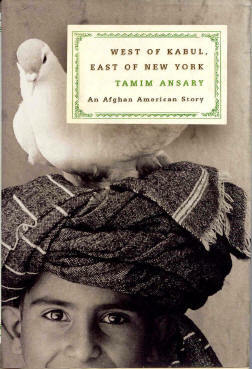 Review: West of Kabul, East of New York: An Afghan American Story by Tamim Ansary; Farrar, Strauss and Giroux; $ 22.00; 292 pages. West of Kabul, East of New York is San Francisco author Tamim Ansary's memoir of his childhood in pre-war Afghanistan and adulthood in the USA with travels in Europe and Africa. Ansary's account centers on the effects of wars, secularism, and Islam on his life and the lives of his loved ones. Tamim Ansary is known to millions as the author of the September 12, 2001 "email sent round the world" that challenged the perspectives of both left and right and opened the eyes of Americans to show us that the Afghan people were not our enemies and in fact were also victims of Bin Laden and his cohorts. West of Kabul, East of New York is also written in the shadow of September 11, though not as overtly. Ansary's theme, as he tells a fellow anti-Taliban Afghan, is to "help Americans see that Afghans are just human beings like anyone else." The book seeks to explore and explain the "lost world" of Afghanistan before the Soviet war and Ansary's journey from there to modern America. As his memoir unfolds, two impressions emerge. First: Tamim Ansary, a native of Afghanistan and now a citizen of the USA, respects and appreciates both cultures. Second: Islamic fundamentalism is based primarily on religious and cultural issues, not on economic disparities as many Westerners – especially leftists – assert and as Ansary himself originally believed. Ansary's admiration of both cultures comes through clearly in the book's opening chapters. He begins by describing Afghanistan before its tragic downward spiral during successive wars. Although poor and primitive – "might as well have been living in Neolithic times" is his phrase – the Afghanistan of his childhood was a land of simple yet quite substantive virtues. In presenting this "lost world," Ansary defines and describes Afghan concepts in terms that are both clear and enchanting. His concise and recognizable description of the Afghan family structure is superior to any presented in the several books I have read. Ansary states that "our group self was just as real as our individual selves, perhaps more so." Islam is shown to be a "custom and a way of life." He describes the timings of prayers as "a rhythm set not by any clock but by the light of nature." He illustrates such abstract points with solid examples. In the case of family life, he notes that Americans (he includes himself) "need solitude" so that "we can hear our own thoughts." However: "My Afghan relatives achieved this same state by being with one another." One problem with his depiction of pre-war Afghanistan is that he neglects to mention two major social problems. Women's issues are not examined in much detail, and the problems of poor Afghans are also barely addressed. This is not only an omission of two very important issues which figured prominently in the recent wars; it detracts from the book's real strengths, such as describing the roles of Islam and families. It may even make some readers feel that his portrayals of Afghanistan's genuine qualities are based on nostalgia rather than reality. As a result some readers may dismiss his accurate and valuable insights into Afghan society. Ansary is also American and not just by immigration. His mother who taught him English was a Finnish American from Chicago. Many of his schoolmates were Americans whose parents came to Afghanistan to help develop the Helmand Valley irrigation project. When he immigrated to the USA at the age of 16, Tamim Ansary already knew and admired much about the nation that would become his next homeland. Shortly after his arrival in 1964, he joined the emerging counterculture that would change American society even as very different forces were changing Afghanistan. His younger brother Riaz also came to the USA but began in the 1970s to study Islam's more extreme philosophies. At first the two brothers discussed their different outlooks in civil tones but with an undercurrent of tension that built to an inevitable and unfortunate clash. Like most such family quarrels, their dispute remained verbal but the imagery of their words was brutal. In 1980 Ansary traveled to North Africa and Turkey. On assignment for Pacific News Service, he decided to tell people he encountered that he was a Muslim trying to rediscover Islam, though he was actually going there to write a story about the Islamic revival. Furthermore, he had already decided that the causes of this movement were the same as those of "every other revolution: hunger, poverty, disease . . . and so on." But as he traveled through those countries and met poor Muslims, he questioned the assumptions made so easily in discussions with Western intellectuals. "What if the revolutionaries really were fueled by spiritual and not material hunger?" From starting to question his ideas about his subjects, he then questioned his assumptions about himself. "I realized I was pretending to be a journalist in order to pursue my real goal of exploring my roots." That he became willing to raise such questions about his work and himself shows Ansary maturing as a thinker and opening his mind to unconventional ideas regarding important issues. When he arrived back in his adopted homeland, he threw himself into volunteer efforts to aid those suffering in his native homeland. This brings the reader into the 1980s and shows the tiny but growing Afghan American community struggling to deal with the usual immigrant issues of identity and adaptation along with the ravages of a faraway yet omnipresent war that was devastating the lives of their families and themselves. Here Ansary has a chance to verify his theme that "Afghans are just human beings like anyone else." He does so though in such understated ways that his message sometimes gets lost in the storytelling. While he shows that Afghan Americans can be petty over important matters, he also shows their cultural virtues rising to the fore. He describes, for example, how the Afghan American charity Help The Afghan Children performed heroically in the face of the awesome tragedy. And when he and his siblings considered selling their house back in Kabul, his fundamentalist brother vetoed the consensus out of concern for the homeless people squatting there. In his attempt to show that Afghans are "just human beings like anyone else," Ansary will succeed with readers who understand that human beings are imperfect. He refuses to romanticize Afghans even as he shows that they are not extremist villains. Like many Afghans and a growing number of Americans, Ansary appreciates Sufi prose and poetry. A characteristic often found in Sufi stories is a hidden theme or lesson. West of Kabul, East of New York does not openly suggest that there is an alternative to the extremisms of fundamentalism and post-modern secularism, but it does respectfully portray a way that is different from both systems. With all its imperfections, the "lost world" of pre-war Afghanistan offers some virtues that we in the West might consider adopting. Though the Ansary family was fairly well to do – they owned land and employed servants – they "didn't produce any garbage" and didn't own a car (though their father later had access to one when he gained an important government post). As Ansary points out, theirs "wasn't a thing-centered world." While attempting to show Americans that Afghans are "just human beings," perhaps West of Kabul, East of New York also asks those of us in this rich and powerful country to live as "just human beings." Howard Williams served as an aid worker in annual journeys to Pakistan and Afghanistan from 1989 to 1997. Tamim Ansary will read from West of Kabul, East of New York at Cody's Books in Berkeley on Sunday, June 2 at 7:30 pm, and at A Clean Well-Lighted Place for Books in San Francisco on Monday, June 3 at 7:30 pm.